The venue hosted the Champ Car World Series Grand Prix of Montreal from 2002 to 2006. The Canadian Grand Prix of Formula One racing, which had taken place for 30 years at Circuit Gilles-Villeneuve, was dropped from the 2009 Formula One calendar and replaced with the inaugural Abu Dhabi Grand Prix. On November 27, 2009, Quebec's officials and Canadian Grand Prix organizers announced a settlement with Formula One Administration and signed a new five-year contract spanning the 2010–2014 seasons. The 2011 edition took place on June 12 at 1:00 pm (17:00 UTC) and was the longest World Championship Grand Prix ever, due to a lengthy rain delay. Originally named the Île Notre-Dame Circuit, the circuit was built and finished in 1978. In what has proven to be the venue's main event over the decades, the FIA Formula One Canadian Grand Prix had been part of the Formula One World Championship for 10 years, and it was previously held at Mosport Park near Toronto on 8 occasions and in 1968 and 1970, the Mont-Tremblant circuit in Quebec. With safety concerns with Mosport blighting the 1977 event, it was decided to move the race to the new circuit in Montréal. In 1982, it was renamed in honour of Canadian Formula One driver Gilles Villeneuve, father of Jacques Villeneuve, following his death earlier in the year. The circuit is located in a part of the city of Montréal known as Parc Jean-Drapeau. The park is named after the mayor of Montréal who was responsible for the organization of Expo 67. The race circuit lies across Île Sainte-Hélène and Notre Dame Island, a man-made island in the St. Lawrence River most of which was originally built up for the Expo in 1967. Saint Helen's Island was also artificially enlarged for the Expo '67 fairgrounds and a prominent remnant of the fair, the Biosphere can be regularly seen during television coverage of racing events. Almost half of the track – from the hairpin turn until after the pit area – runs alongside the Olympic Basin, a huge rectangular basin which was created for the rowing and canoeing events of Montréal's 1976 Summer Olympics. Barriers run close to the circuit and many experienced drivers have been caught out by them. A particularly famous part of the circuit is the wall on the outside of the exit of the final chicane before the start/finish straight. In 1999 the wall, which bears the name Bienvenue au Québec ("Welcome to Quebec") giving it the nickname "Mur du Québec" (Quebec Wall), ended the race of three Formula One World Champions, Damon Hill, Michael Schumacher and Jacques Villeneuve along with FIA GT champion Ricardo Zonta. Since then the wall has been nicknamed "The Wall of Champions". In recent years 2009 world champion Jenson Button (2005) and four time World Champion Sebastian Vettel (2011, during free practice) have also fallen victim to the wall. Changes made in 2005 to the curbs on the final chicane were controversial amongst drivers in the run-up to the Grand Prix. The curbs were made higher and more difficult for the drivers to see, making it even more challenging. 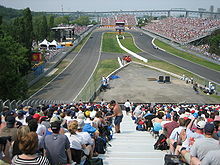 On June 23, 2006, the Canadian Press reported that the city of Montréal had awarded exclusive rights to stage the two allowed race weekends on the track to Normand Legault, promoter of the Formula One Canadian Grand Prix. The deal was for 2007 to 2011, with an option for 2012 to 2016. Legault decided to replace the Champ Car race with races from the Grand American Road Racing Association's Rolex Series and NASCAR's Nationwide Series, respectively – the latter series' first race north of the Canada-United States border. On August 4, 2007, Kevin Harvick made history by winning the first NASCAR Busch Series (now Xfinity Series) race at Circuit Gilles Villeneuve in what was one of the most controversial NASCAR races ever, as Robby Gordon claimed to have won the race. The NASCAR races have affected the circuit layout. An expansion of the pit lane took place, since a NASCAR pit lane must accommodate a minimum of 43 cars. The 2008 race made history as the first NASCAR race to run on rain tires. In 2017, due to the new safety requirements imposed by the FIA, the circuit had new Tecpro barriers installed, after removal of older tire barriers by May 2017. With the 2017 technical regulations, experts predicted the F1 cars to be quicker by three to five seconds a lap in June at Montréal. The introduction this 2017 season of faster Formula 1 cars has forced the FIA to revise the safety features of every F1 circuit. 2017's F1 event saw a change to the exit of the last chicane (the Wall of Champions) with its angle modified, because the FIA found it was dangerous. The complex of turns one and two has become known as the Senna 'S'. From a bird's eye view turns one and two together can represent an 'S' shape. Since the pit-exit was redesigned merging into turn two, the 'S' shape is not so evident on first glance. The very fast Droit du Casino corner (Turn 8) is after the bridge underpass and is known as a 'quick kink' before Turn 9 and the rush to a passing zone at the Hairpin curve. Turn 10 at Île Notre-Dame is probably the best example of a 180° hairpin turn design with full wheel lock during F1 competition. The various lines taken entering the hairpin curve can predict overtaking on the apex, or exit during race competition. Braking too late can see racecars offline into the runoff area, and many spinning in front of packed grandstands. Many overtakes can be seen at this location due to engine differences and drivers' racecraft. Entering turns 12 & 13 drivers encounter one of the best passing zones completing the long straight after the hairpin. Many duels have been seen exiting turn 12 with some racecars deciding to cut corner 13 into the run-off, with many daring speed demons going a bit 'too hot' apexing Turn 13 and not exiting intact. Turn 14 is dubbed the "Wall of Champions" after three former Drivers' World Champions found the outside wall in the 1999 race. In Formula 1 races, a car damaged after gracing the Wall of Champions brings out a Safety Car or VSC. The exit barrier is poignantly marked with advertising by Tourisme Québec each year during the F1 event. As part of Parc Jean-Drapeau, the Circuit is open to visitors, between races, for walking, running, biking, in-line skating, and driving. During the few days of the Grand Prix, Notre Dame Island is one of the noisiest places in Montréal. Other times of the year, it is one of the quietest, being located in the middle of a river, on an island filled with greenery and animals, joggers and cyclists. However, on June 4, 2009, administration of Notre Dame Island has forbidden the access of competitive cyclists to the circuit, justifying this as a security measure to avoid the increasing injuries that occurred between year 2008 and 2009. A total of 27 injuries have been reported. The ban on cyclists has since been lifted due to protests. In 2002, Formula One driver Juan Pablo Montoya set pole position for the Canadian Grand Prix with a lap time of 1:12.836. Several weeks later, during the inaugural Champ Car Grand Prix of Montreal, Cristiano da Matta set pole position with a lap time of 1:18.959. In 2006, the last time Champ Car and F1 ran on the same track, Formula One was 5 to 7 seconds faster than Champ Car. The pole position in Formula One was set by Fernando Alonso in a time of 1:14.942, while Sébastien Bourdais set pole in 1:20.005 in Champ Car. The fastest lap in the Formula One race was 1:15.841 by Kimi Räikkönen, while Sébastien Bourdais's fastest lap was 1:22.325 in the Champ Car race. 2007 NASCAR Busch Series driver Patrick Carpentier racing in the NAPA Auto Parts 200, posted a pole time of 1:42.086. The pole time at the 2012 NAPA Auto Parts 200 was 1:40.865 by Alex Tagliani. By comparison, Carpentier's 2004 Molson Indy Montreal qualifying time in the Champ Car World Series was 1:20.836, while Sébastien Bourdais qualified with 1:20.005 in 2006. The track record for the Rolex Sports Car Series is 1:32.620. The time was set by Scott Pruett driving for Chip Ganassi Racing in the Daytona Prototype class in 2010. The fastest ever lap around the circuit was set by Sebastian Vettel with a time of 1:10.764 set in qualifying (Q3) for the 2018 Canadian Grand Prix. Lewis Hamilton set a previous lap record with a time of 1:11.459 during qualifying for the 2017 Canadian Grand Prix earning him pole position. This was Hamilton's 65th pole position which put him level with Ayrton Senna in the F1 history books. After qualifying, Hamilton was awarded a helmet that belonged to his hero Ayrton Senna as a celebration. This helmet was sent by Senna's family and was awarded to an emotional Hamilton in front of the crowd. As this time was set during qualifying, it is not recognized as an official lap record. ^ "Button scores tenth win in longest race ever". F1 Fanatic. Retrieved December 31, 2012. ^ "ESPN – Harvick wins wild Busch race, but disqualified Gordon claims he won – Nascar". ^ "Circuit Gilles Villeneuve". Retrieved September 5, 2011. ^ "Circuit Gilles Villeneuve". Ultimate Racing History. Retrieved March 25, 2013.